Nothing like using a Sunday night to stress over the upcoming Red Sox season (pitchers and catchers in 23 days now). Below are some extracted Bill James predictions for 2010. Recently added player's numbers (Scutaro, Beltre, etc) are based on them being in their prior lineups. Personally, I think he might be bullish on Ortiz, and hopefully bearish on Lester and Lackey....and no player going over a hundy spot in RBI? That would be concerning, no matter how good the run prevention strategy pans out. Good enough? Or still not cutting it? In the AL East...it's questionable. 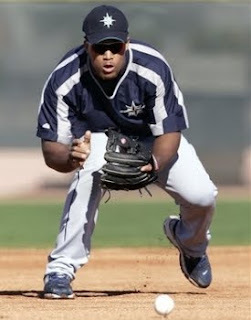 -Jose-Enrique-Igelsias ran through a few drills with the media on hand today....general consensus was to wait for Spring Training and a full year of minor league baseball to pass judgement on the 20 year old... but so far, so good. Also, another side note, he's already started to learn English and dropped some words on the media today....what's up Vlad Guerrero??? You fraud. -Anyone else a little pissed about the quick title of "Unanimous Team of the Decade" SI is spooning to the Yanks? Look at the efficiency numbers, and last time I checked, the Sox took home two pieces of hardware as well. I'm not saying the Sox should have that title, rather I'm just pointing out the ball-washing going on. PS: Check out the Marlins and Twins on those break outs....who says it's all about payroll? -In the nothing to do with Boston but we'll make it seem that way category: Tim Lincecum should be so upset with the low-balling San Francisco Giants that he should demand a trade to the Red Sox. Perhaps the best young pitcher in the game and you low ball his demand by 5 million bucks? That's a slap in the face. Timmy, if you're reading this, Boston is the San Fran of the East Coast...except Boston will pay you more, provide you with the chance to win championships every year, and the fans here actually care for our team. That should do it, sold. -Less than a month until pitchers and catchers...who's "tentatively excited" with me? According to a source close to the negotiations, J-Pap has a one year deal in place with Boston for a reported 9.35 million. Theo and the Sox apparently waited until just before the arbitration deadline to lock up the Sox closer for 2010. At just over 9 million, the deal doesn't put Pap in the "highest paid closers" bracket that he wants to be in....but it's nothing to sneeze at. T Murph says Pap wanted 10, Theo countered with 8, and this is how it shook out. That said, consider the source on that one. Quick research shows that Pap now sits just outside the top 5 closers when it comes to salary (didn't Billy Wagner get 10 and change from the Braves right before his arm fell off?). There are still a number of closers making significantly more than Pap, with Mo setting the gold standard at 15 million per year. Also, give some quick thought to how many mediocre starting pitchers make well over 10 million dollars a year (Oliver Perez, Derek Lowe (15! ), Bronson Arroyo, Jeff Suppan, Dontrelle Willis....and I'm pretty sure Rick Vaughn made more than 10 per as well....yes, that Rick Vaughn). Tough to be too mad at 9.35 million for a guy to close out games for a 170 million dollar team. 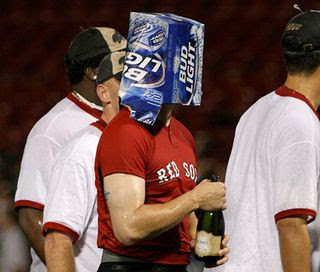 So despite the "Papelbon fatigue" we're all feeling of late as a result of the running of his mouth, a mediocre 2009 by Pap's high standards, and the horrible memory from early October 2009......Sox fans shouldn't be upset with this deal. Besides, it gives us another year for Bard to continue to wet his feet and pitch a greater number of close and late innings....and sets up the possibility of trading Pap in the future if need be (to keep him away from the Yanks). I'm far from ready to swear off Papelbon, but I think this continues the Sox along the right future path. Coakley Calls Schilling a Yankee Fan? Former Red Sox ace Curt Schilling blasted Martha Coakley Saturday after the Massachusetts Democratic Senate hopeful told a Boston radio talk show host that Schilling, a Republican, is a Yankees fan. This is a serious charge in "Red Sox Nation": Schilling is a part of baseball lore as the pitcher who battled through pain with a bloody ankle in 2004 to defeat the Yankees in Game Six of the American League Championship Series. "I've been called a LOT of things," Schilling wrote on his blog at 1:06 a.m. ET. "But never, and I mean never, could anyone ever make the mistake of calling me a Yankee fan. Well, check that, if you didn't know what the hell is going on in your own state maybe you could…." Schilling, who considered running for the Senate seat, is backing GOP nominee Scott Brown in Tuesday's special election to replace the late Sen. Edward Kennedy. Coakley quickly recanted her assertion after host Dan Rea challenged her on the statement in the Friday interview. A campaign spokesman told CNN that Coakley simply failed to deliver on the joke. 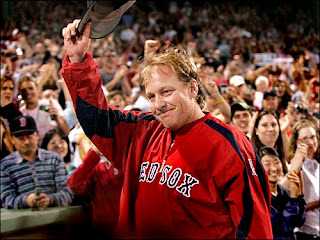 "Curt Schilling has been involved in a lot of strike outs over time," the spokesman said. "I guess Martha whiffed on that joke." I will forever love Schill for 2004, and 2007 for that matter.....but that is where the love ends. As for Coakley...I haven't decided yet if she has a speech impediment or is simply trying too hard to push a fake Boston accent. Either way, she's effectively managing to kick herself while she's down. I've had a lot of people ask me for thoughts on Mark McGwire, and for the most part I'm sure I've disappointed them when only saying "He just confirmed what we already knew." To be honest, that's the truth, we shouldn't be surprised... nor should the news be covering this more than the huge earthquake in Haiti...but I digress. I'm also not sure how much more of McGwire's mangled neck I can look at. You'd think a millionaire would have that fixed up right? Digressing, again....sorry. Anyways, I'd hate to say it, but Jose Canseco was right...he may be a big dumb animal who is constantly on the brink of bankruptcy, but he was right. McGwire's claim that roids didn't help him drop taters at a faster rate (per AB) than anyone else in history is complete crap. Time may have softened the media's rage, but I don't buy anything that Big Mac is selling. If you can read and can navigate Baseball Reference, you can see that his post 1993 numbers (and ratios) skyrocketed. Not only did he break the rule of no crying in baseball, he also sank any small glimmer of hope he may have had to make the Hall of Fame.....you can't tell nerds (see Tony Mazz), not to believe the numbers. So let's get beyond it. The game is cleaner than it has been in some 30 years, but it will never be void of cheaters. I just feel bad for the Wolly Joyners of the world who lost out on so much because of the era in which he played. (ITM note: that said, I don't trust anyone at this point...T Murph is probably on the juice for all I know). As a sport, baseball, despite the economy, is transitioning out of the steriod era farily successfully....let's close the book on it. 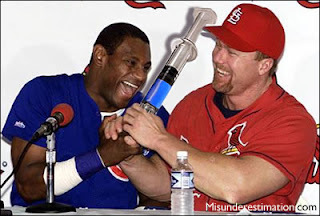 Then again, maybe McGwire's admission will push Sosa and Bonds to finally come out and confirm they're the frauds we all know they are. Thanks to misunderestimation for the pic. In the past, we here at ITM usually let a day go by before blogging about a Red Sox move....or at least a night of frantically calling each other to talk one another on...or off a ledge. But it's been a while, and the last I heard from T Murph he was screaming at some WWF return of Brett the Hitman Heart or something, so I figure, why not. The Sox have signed a gold glove third basemen for effectively, one year and at short money. A third basemen who struggled through an injury-plagued 2009. A third basemen who will be driven to produce after accepting a one year deal to bolster his free agent value in 2011 (unless he's a complete bust, he's not picking up the 2nd year option). A third basemen that had an "anomaly " of a year in 2004, but produced consistent quality power by hitting 25, 26, and 25 taters from 2006-2008. Sure he's a career .270 hitter, with questionable numbers, but his overall production should increase with 81 games at Fenway and being part of Boston's lineup (take a look at his home/away splits at some point). Is he Adrian Gonzalez? Far from it....but is he better than Casey Kotchman? Yes. The Yanks offense will bash everything out of that bandbox of a stadium, and the Sox will hope to win almost every game by a 3-2 margin. The Red Sox now have a number of players who could very well hit 20 taters...but none that have a shot of hitting much more than 30. This deal effectively ends the Red Sox offseason moves, so we need to get used to it. Update: I woke up this morning and realized I failed to mention how the Red Sox continue to just kick Mike Lowell in the ribs while he's down. They clearly want nothing to do with the poor old guy. Word is he'll stay on the trading block, but the Sox have been amazingly effective in devaluing him all by themselves.